Nelson’s Victory is block 17 from issue 18 ‘Art of Quilting’. Only 12 pieces but boy did those little pieces cause trouble! This block is a variation of the Trafalgar Block which I made back in March. I had trouble with that one too but to be honest, I would gladly make another 20 of those before I made another one of these! Nelson’s Victory was included as an opportunity to practice the set-in seam technique. I really haven’t mastered it fully yet. When I can do it in less than an hour without holding my breath once, I will let you know! In-set seams really have to be accurate. finishing the next seam at exactly the point of the previous one finishing. In a nutshel: The blue spotty and Brighton print tapered rectangles are sewn together first, along their diagonal sides, from the edge of the pointy bit to 6mm short of the other end. 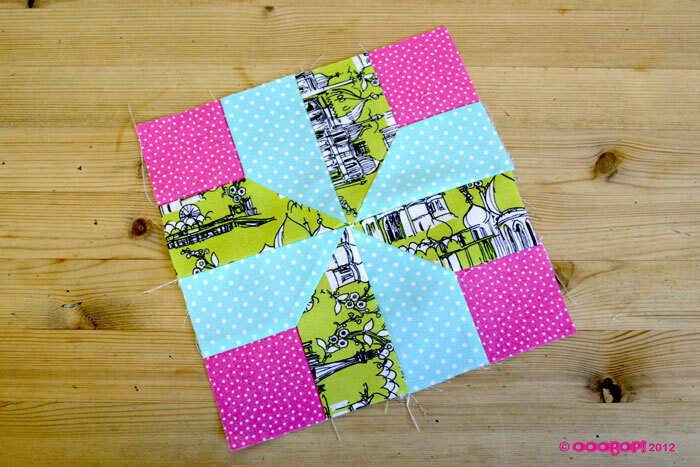 Then the pink spotty squares are in-set, first seamed to the blue and then to the Brighton edge. Then all four little blocks are seamed together to make the finished block. All was going swimmingly until I sewed the final centre seam to find that all that breath-holding and tongue-poking (I’m so glad no one watches me when I sew) was in vain, and the points only matched up in half the places they should! Oh well… what’s the point in it looking perfect? No one will recognise its handmadeness otherwise! History: Dates back to 1906 to commemorate the Battle of Trafalgar (which took place a century earlier) in honour of Lord Nelson’s flagship, HMS Victory, which led the British fleet. Level: Some experience needed for the set in corners… just a bit! I look at this block Janene and cannot help but think it would be easier of those pink spotty squares were actually two half square triangles! Then you wouldn’t have to do set ins 🙂 Moi, lazy? Jamais! Oh,it basically Is this block with triangles hehehe. Still, if the triangles were the same fabric… heehee! ‘Nobody will recognise its handmadeness otherwise’ – my philosophy exactly! It still looks beautiful and I love the ‘Brighton’ fabric – who is it by? Thanks so much Tialys. The Brighton fabric is by Makower I believe.